Jesus to Angelica (and all of us by extension): It is necessary to forgive, because they have not forgiven many people, and that is why many people are in this place, because they failed to forgive…Go and tell humanity that it is time to forgive, and especially My people, for many of My people have not forgiven. Tell them to rid themselves of grudges, of resentment, of that hatred in their hearts, for it is time to forgive! If death were to surprise that person who has failed to forgive, that person may go to hell, for no one can purchase life.” This will be the mission of my 55th year – double grace — to spread the truth and deepen ordinary people’s knowledge of who ends up in hell and why. How popularity or power or position do not matter when God’s breath of life has been removed. Please read prayerfully and spread the word as a companion to going unto all the world and sharing the gospel. We all need to energetically repent and engage with popular culture and people we meet in stores, lines, events, gas stations…anyone and everyone must be told that eternity lasts FOREVER. 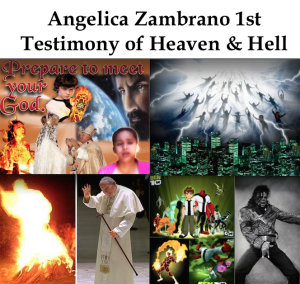 Heaven and Hell, and the Return of Christ.